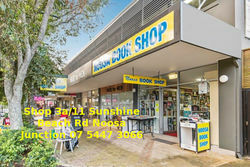 Noosa Book Shop is located in Noosa Queensland Australia on Sunshine Beach rd and open 7 days a week. We are 36 years young and our strength is our fantastic service. We have secondhand, rare and out of print and some new books as well as Cd's Dvd's and Coffee table books. Our new website is virtual so you can search our shelves from the comfort of home and chat via our chat button direct with us. Book Detective services are available for that hard to find, out of print or rare treasure. We ship world wide and drop ship world wide. If you are having trouble finding something, give us the details you know and let us do the work. Terms of sale for Noosa Book Shop All sales are final.